Discussion in 'Journalism topics only' started by TheSportsPredictor, Feb 8, 2006. For anyone who has wondered what it is like to be a sports writer, Christopher Walsh brings you No Time Outs. Detailing his beginnings as a small-time clerk in Florida, to a one-man bureau in Phoenix, to the Green Bay Packers beat at one of the largest newspapers in Wisconsin, Walsh presents his proudest moments as well as his shortcomings. 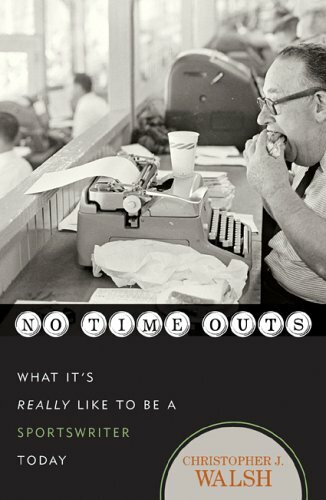 This is the handbook for any aspiring sports journalist -- an inside look at what the job and industry are like, some of the do's and don'ts, and many entertaining sports anecdotes. tsp, you getting a cut of the royalties? This is jacket copy, right? And why am I pictured on the cover? And here I thought this was going to be a thread on Oliver Tse's latest small-time poker expose. Nothing like a contemporary cover image to put the reader in the right frame of mind. i love the picture but i dont' think it'll cause too many people under age 30 to pick it up at barnes & noble. I think I'll get it ....and I am under 25 - but being in the biz, I think you're right leo. I don't see many of my buddies wanted to read this. yeah i should've said no one under age 30 not in the business, formerly in the business or hoping to be in the business. that's a pretty narrow audience. although maybe it'll be a big hit in wisconsin or wherever the guy worked for most of his career. That photo is priceless. Don't care if it's from a different era. I think it stands the test of time, like the Honeymooners. I'm buying it just because of the photo, actually.